Don’t forget a Valentine’s Day treat for your best friend! 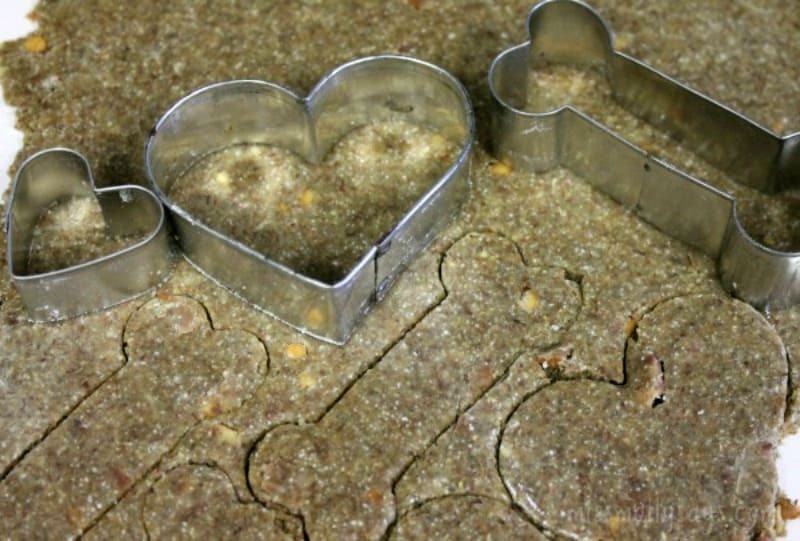 Bake some healthy, delicious homemade dog treats like this Dog Lovin’ Homemade Dog Treats your dog will love. This recipe is made with rye flour and flaxseed meal, and is a good choice for dogs with possible wheat allergies, though the flavor combination of peanut butter and bacon will please any dog. Show them the love! This will make very heavy dough. If you find the dough is crumbly, knead in a little more water. Creamy peanut butter rather than crunchy will make the biscuits easier to cut. Adjust the baking time to your pet’s preference; an older dog may want a little softer biscuit, so try cutting the final hour of cooking time in half. 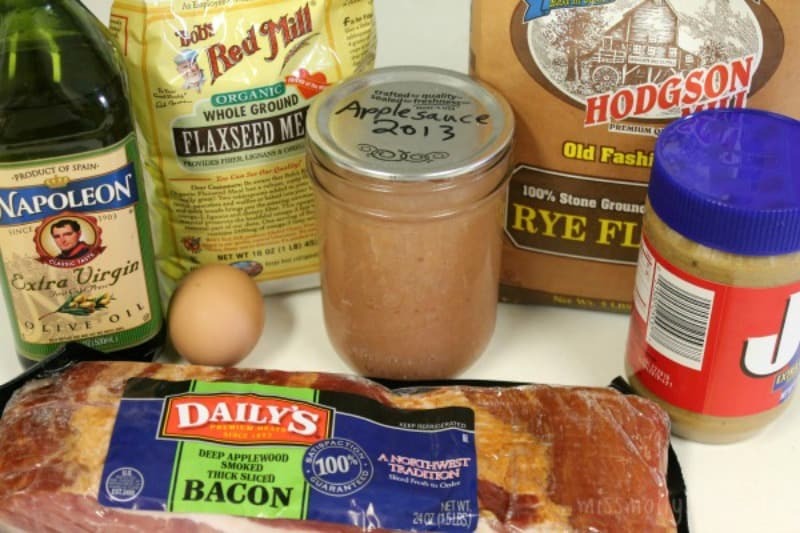 In stand mixer or by hand, combine egg, oil, peanut butter, applesauce, bacon, and water. Mix until well combined. Add flaxseed meal and 2 cups of flour, stirring well. Add the remaining cup of flour slowly. It will be hard to mix, and you may need to put the dough on a floured surface and knead the remaining flour in. Dough should be heavy and slightly sticky. If necessary, add more flour or water until it’s easy to work with. Roll out on floured surface to desired thickness…between 1/4-inch and 1/3-inch, depending on the size and age of your dog. Cut into shapes and place close together on ungreased cookie sheet. Bake at 350 F for 30 minutes, then turn the heat down to 200 F and bake for an additional hour. Remove from oven and let the biscuits sit on the baking sheet until cool. For very hard biscuits, leave them in the oven as it cools down. Like this recipe? Don’t forget to check out my other homemade dog treats, and pin this one to Pinterest! Roll out on floured surface to desired thickness…between ¼-inch and ⅓-inch, depending on the size and age of your dog. 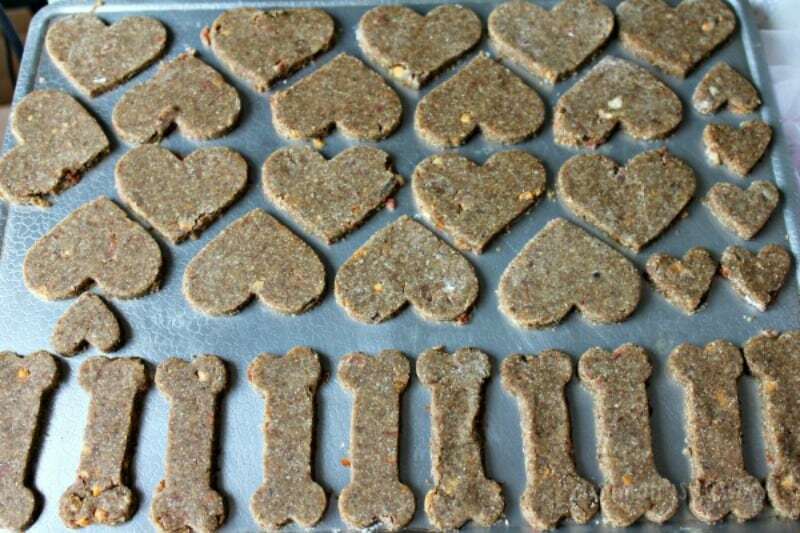 My dog has never had homemade treats, but I am sure she will love them! I don’t have any pets, but this recipe w/ bacon looks good and I’m thinking of substituting some ingredients to make it kid-friendly instead…and still have bacon! Really cute idea to pamper your pets! I have a chihuahua who would love these! This looks like a great recipe that m dogs would love! I am going to try to make them. 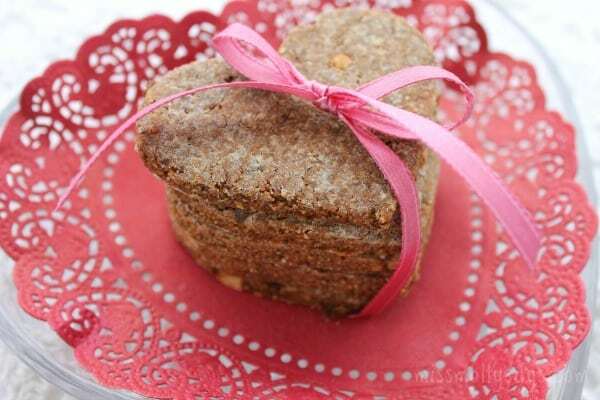 These are such cute homemade dog treats! 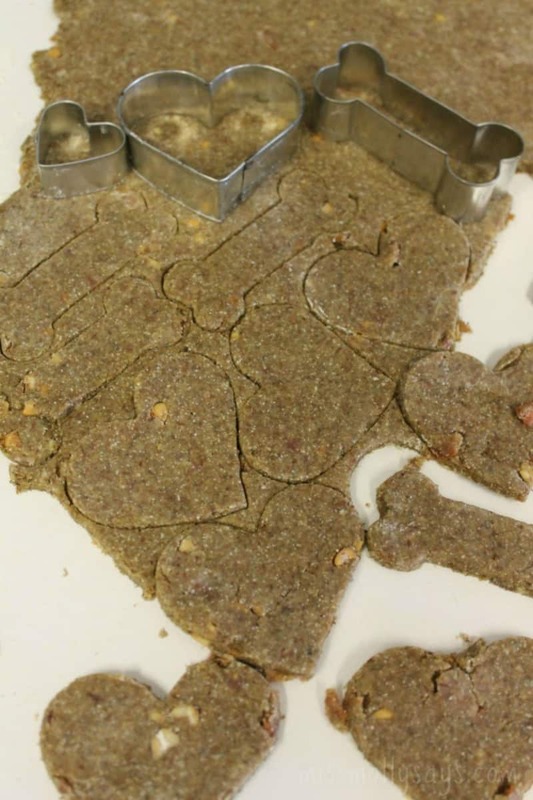 I have never made any homemade for my dog, but this is a very healthy recipe to use to make my dog some biscuits. I will have to try it out! I love this recipe for dog treats. These will be great for making as Christmas presents for their stockings. I am definately going to make these! This sounds like such a great snack for the pups. I love to bake and have been wanting to make my mom’s pups some homemade treats. Those are so cute. My wife likes to try new recipes to give to our dogs and the shelter dogs. I’ve never treated my Sadie to homemade treats. These really look easy to make. I think she would enjoy them! Awww, this is so adorable. Thank you for the extra as needed adjustment tips. My dogs would like these. This is super easy, I have to try this. This would be fun to do and share with friends who have dogs. These dog treats sound good enough for us to share together ? I tried to pin this 5 times, but Pinterest won’t let me because there is not a picture to pin! I see a pic and click save to one of my boards but there isn’t a picture to pin?! Thanks for this sweet valentine treat! I am not sure I understand your problem? You can click on the pin button and it should bring up the picture. 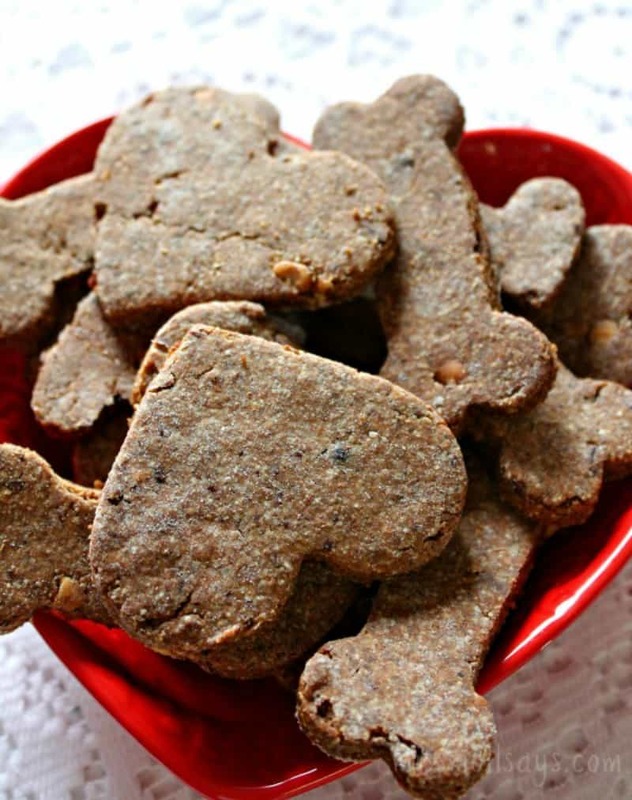 Dog Lovin’ Homemade Dog Treats are just wonderful. 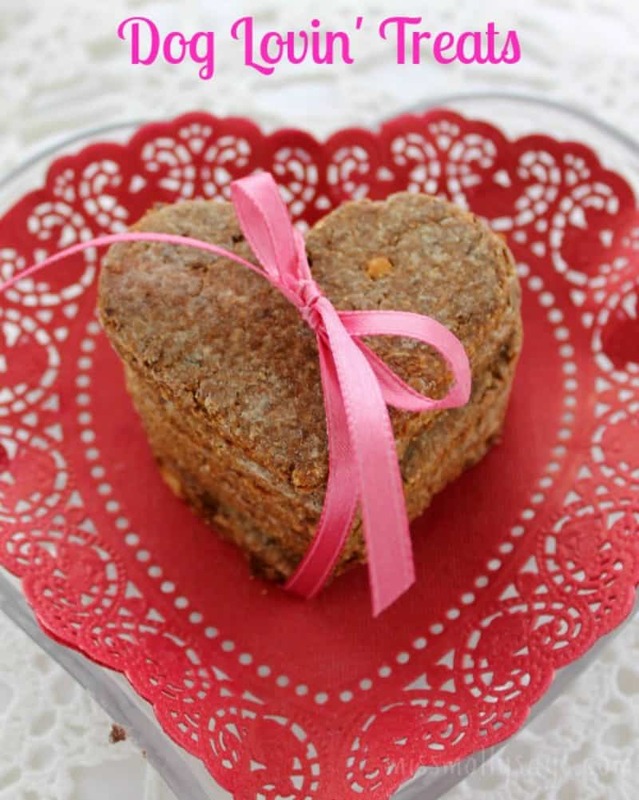 The heart shape is perfect and I am sure all dogs will enjoy this treat. Going to make these for my dogs! Thanks! Bacon!! 🙂 This is definitely the perfect Valentines Day treat for your sweet pup, they probably go crazy over these!! 🙂 I can’t wait to make some for mine, thanks for sharing! I know my dogs would love these. I can see why dogs would love these biscuits. Lots of good flavors. These are so cute for your dog for valentine’s day. Thank you for sharing. I will tell my son about this recipe. This sounds like a great recipe! I need to find some of those bone shaped cookie cutters!! So cute!! I buy them some at Christmas and they love them, so maybe i should make them so they can have more than at Christmas. Good call about the xylitol, I forgot that it is bad for dogs. I have been cooking with more natural sweeteners and it would be awful to make his treats with something that could hurt him! This recipe looks really yummy. Thanks for sharing. Thanks for the recipe and profound insights. or dogs would love these! Ive never tried to make them treats before. My dogs love treats, so I know they would love this. Thank you for sharing this recipe. I have not made anything like this before. Such healthy ingredients, it is a cute and yummy-sounding treat for your very special doggie!!! Thanks for the recipe. I have most of the ingredients and will try this soon. I’m going to share this post because I know so many people with dogs and I know they are going to just love this super easy recipe that there dogs are going to love. I would love to try this recipe. I’ve never made dog treats!